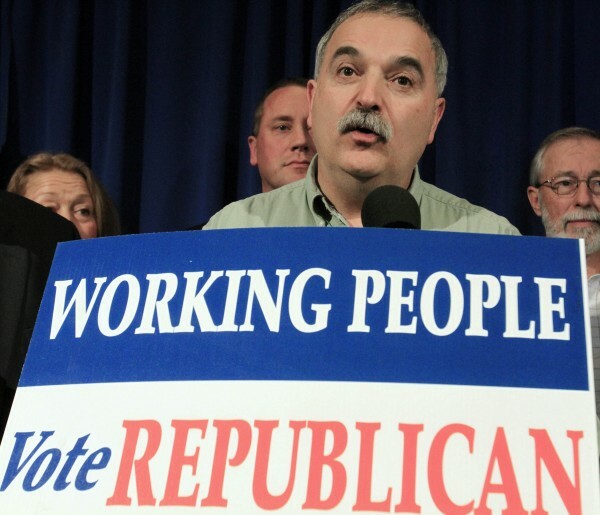 AUGUSTA, Maine — For the second time in two years, the annual convention of the Maine Republican Party could be marred by in-fighting, although if 2010 is any indication, that might not necessarily hurt the party. In the last few days, GOP Chairman Charlie Webster has come under criticism for announcing in a recent email that Charles Cragin of Raymond would be chairman of this weekend’s convention. The party’s own bylaws, however, indicate that a convention chairman must be selected at the convention, not beforehand. So, did party officials violate their own rules? Brent Tweed, a Maine GOP state committee member from York County, wrote a follow-up email to party members urging them to remove any doubt by simply electing a chairman this weekend. Tweed nominated himself. “In a year when election missteps have rocked our Maine Republican Party, I believe that we need a convention chair elected by the people and not appointed by established powers,” he wrote. The Maine Republican Party state convention will be held Friday-Sunday, May 4-6, at the Augusta Civic Center. The event is largely a party-building exercise and a chance for members to hear from congressional candidates and others. But there is business to be done as well, the biggest task of which is to select delegates that will represent Maine at the National GOP Convention in late August. That process could prove tricky in the wake of the state party’s handling of the presidential caucuses in February. On Feb. 11, the party declared former Massachusetts Gov. Mitt Romney the winner of a presidential preference poll and de facto winner of Maine’s caucuses. That announcement was made before all the votes were counted, a move that angered supporters of Ron Paul, who finished a close second. In the days that followed, GOP officials admitted they made mistakes by omitting certain votes and by not allowing Washington County Republicans to have their votes counted. The Washington County GOP canceled its caucuses on Feb. 11 because of a pending snowstorm. The Maine GOP later updated its results to include Washington County. It didn’t change the outcome, but it also didn’t eliminate the black eye left on the party because of all the negative attention. As the outspoken and sometimes polarizing head of the Maine GOP, Webster has taken the brunt of the criticism. That criticism bubbled over into a party meeting in early March during which some attendees wanted Webster to explain himself and others wanted him to step down. After a two-hour closed door meeting, state committee members voted to keep Webster as Maine GOP chairman. However if any bruised feelings spill over into this week’s convention, particularly by Paul supporters, Webster again could find himself in the middle of controversy. Another large but mostly ceremonial part of the convention is the adoption of a party platform. That’s where the 2010 convention generated headlines. This year’s version already is decidedly less controversial than the platform that was adopted two years ago, but it still contains a number of talking points, both for members of the Republican Party and for the party’s opponents. Gone are obscure references to “Austrian economics” and calls to “reject the UN [United Nations] Treaty on Rights of the Child,” and plans to eliminate the U.S. Department of Education that were part of the 2010 platform supported overwhelmingly by tea party members. Included are suggestions to “oppose all attempts to establish a Maine Woods National Park,” and to support “freedom to work laws” that allow employees to decide whether to join a union. Perhaps the most controversial piece of the 2012 Maine GOP platform is the line about protecting the American legal system from Shariah, or the law associated with the Islam faith. Although many states have moved to consider bans on Shariah, lower courts have ruled that such bans are unconstitutional. The 2012 platform still needs to be adopted by the party as a whole this weekend and, as 2010 proved, that’s not a done deal. During the 2010 event, the original platform was scrapped at the last minute in favor of a tea party-backed document created largely by the Knox County Committee of the party. Not everyone was happy about the last-minute change. Even Dan Billings, chief counsel to Gov. Paul LePage, concluded that the 2010 party platform contained “nutcase” stuff. Still, the adoption of the 2010 platform that was seen by some as controversial didn’t affect the November elections that year. In fact, it might have helped: Gov. Paul LePage was elected and Republicans won enough seats statewide to wrest control of the House and Senate, which had been in the hands of Democrats for decades. The Maine Democratic Party will hold its convention from June 1 through June 3. Correction: An earlier version of this story said the convention would be held May 3-5. The convention will be held May 4-6.